The annual Novena in honour of The Mother of Good Counsel will take place in St Joseph’s Church, Castlemartyr, from the Tue 23rd April to Wed 1st May at 7.30pm each evening. 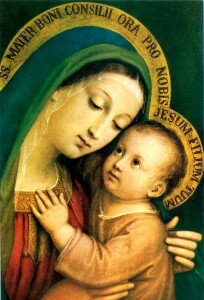 Novena Prayers, Rosary and Benediction will be offered each evening of the Novena. Devotion to The Mother Of Good Counsel has been ongoing in Castlemartyr for nearly 100 years. Note A: On Saturday 27th Apr, the Novena prayers are integrated into the 7 pm Vigil Mass. Rosary will be recited prior to this Mass. Note B: The parish priest of Imogeela will offer a number of Masses (dates unspecified) for the intentions of those who attend the Novena.